Yasser Arafat’s tomb has been opened, samples taken from his body by a Palestinian medical team, and placed in the hands of “forensic experts” from several countries. 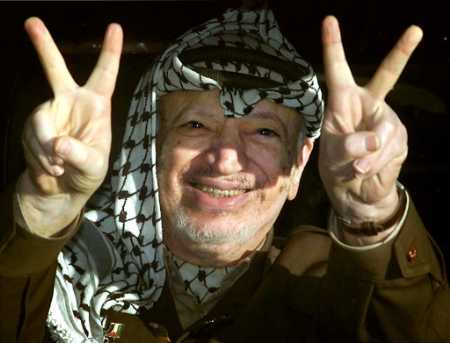 Arafat’s porcine widow Suha claims that she found traces of radioactive polonium 232 on clothes that she had kept since his death in 2004, although the hypothesis that he was poisoned by polonium is physically impossible (see also here). Now that is what I call a scientific diagnosis! I wonder what his ‘investigation’ will reveal? Especially since the samples were taken by Palestinians. Of course Arafat was in terrible shape at 75, had been badly injured in a plane crash some years before from which he had not fully recovered, and had incompetent doctors (the Dr. Abdullah quoted above is an example). It’s not at all surprising that he died when he did. …there was a clear Israeli decision not to kill Arafat taken in the 1970s. A much-seen photo of Arafat taken through the scope of an Israeli sniper rifle in southern Lebanon was circulated following Arafat’s 1982 evacuation from Beirut. If Israel had wanted to kill Arafat it had numerous opportunities to do so when it mattered, not at the end of his career when he was largely discredited. Incidentally, the Israelis-poisoned-him theme has been used repeatedly in the case of others whose death obviously had other causes. The Palestinian leader Faisal Husseini and the publishing mogul Robert Maxwell immediately come to mind. This kind of thing is merely a modern-day version of the Protocols of the Elders of Zion. A fair-minded observer might start thinking: something different is going on here, some hidden agenda or psychological factor that impels Israel and the Jews being put into a special category with negative implications in today’s world. As it once was for so many centuries. It is business as usual for Arab media to find murderous conspiracies that can be blamed on Jews or Israel. What I find surprising is the degree to which the mainstream Western media take this absolute rubbish seriously. CNN’s Christiane Amanpour interviewed Suha Arafat and wrote a similar article, also with a one-line denial by an Israeli spokesperson. This article is a bit better than Laub’s, because it presents some of the reasons that the polonium theory is unlikely to be true. But again, the impression it leaves is that the jury is still out on whether Arafat was poisoned (and if he was, no possible suspects beyond Israel are discussed). Neither Laub nor Amanpour give anything but a passing mention to Arafat’s remarkable history of murder and terrorism, although both refer to his Nobel Prize. A Google News search shows similar ‘reporting’ from numerous sources. This has all of the signs of a Pallywood production. The independent investigators, working with samples of the terrorist’s flesh provided by Palestinians, will — shockingly — find evidence of poison! And you can bet that Karin Laub and Christiane Amanpour will be on the scene to speculate about who killed the great leader of the Palestinian people. My last post about the recent mini-war with Hamas and friends in Gaza argued that the outcome was not positive for Israel. Since then, several respected commentators (here and especially here) have argued that the results of the war for Israel were actually quite good, given what’s possible in the Middle East. The joyous celebrations in Gaza, they say, were of a piece with the 1967 Egyptian broadcasts reporting that their tanks were entering Tel Aviv. It’s true that Israel destroyed a huge amount of missiles, ammunition, smuggling tunnels, workshops and other assets of Hamas. Some important Hamas leaders were killed. The Iron Dome system was remarkably effective, keeping Israeli homefront casualties to a minimum. It will take Hamas several years to rebuild and rearm for the next round. It’s also true that the options for a complete victory — or rather, what would follow such a victory — were limited. If Hamas were wiped out, who would administer Gaza? Israelis do not want to see their sons and daughters doing occupation duty in Gaza. But from a psychological point of view, the imposed cease-fire — and it was imposed, by Barack Obama and his ally Mohammed Morsi — is not a victory. Consider: the cease-fire negotiations — indirect as they may be — treat the fundamentally racist and terrorist Hamas as a legitimate regime, rather than a gang of murderous outlaws. There is already talk of some concessions that Israel will make to Hamas in return for quiet! Hamas exemplifies the atavistic attitudes and behavior that have been rejected by enlightened society for hundreds of years (this should be particularly clear to the highly ‘cultured’ Europeans, but of course it isn’t). Hamas, not Israel, should take responsibility for the violence. And this: the number of civilian casualties that Israel is permitted to inflict in the process of defending itself is close to zero. This is supposedly based on ‘humanitarian’ considerations, but of course these only apply to Israel, not to the US in Iraq or Afghanistan, not to NATO in its various campaigns, and of course not to places like Syria where rivers of Arab blood can flow before anyone will intervene. The message is that they can try to kill us, but we have to try not to kill them. This is reinforced by the way Iron Dome and other defensive weapons are presented as ‘solutions’ to the threats of terrorist entities like Hamas and Hizballah. The Iron Dome systems are a wonderful technical achievement which doubtless saved hundreds of lives, and Israel should build more of them — a small country surrounded by enemies must be able to protect its population. But there is an unfortunate side to its success. During the years of rocket bombardment that led up to the war, international institutions and leaders were for the most part silent, because it has become expected and unexceptional that racist terrorists to do their best to murder innocent people. If Israel’s response is primarily defensive, then this becomes normal. Attempted murder is not normal, it is criminal and criminals ought to be punished. Hamas officials responsible for the ongoing rocket attacks should be arrested and tried for war crimes. If found guilty, they should be hanged like Eichmann. Finally, as always the great powers will intervene if it looks like Israel is about to win a victory that makes a real change on the ground (much US and European policy since 1967 has been a somewhat belated intervention to reverse the results of that war). It is enormously frustrating and corrosive to morale to have to fight over and over again without hope of settling anything. It reminds me of a children’s book in which an athletic character brags about having been “in the finals five years running.” Another replies “well, they couldn’t have been that final if you had to keep on doing them.” None of Israel’s wars can be final, and they have to keep on doing them. Perhaps these are some of the reasons Hamas is celebrating while Israelis are glum. The article that follows was published on a blog called Harry’s Place. But at least for now it is unavailable as a result of a denial-of-service attack probably launched by anti-Israel hackers. I am presenting it here in full. I encourage other bloggers interested in the truth to copy it and do the same. Note: the associated photo and video are linked to the site under attack and so are not available. I’ve replaced them with similar illustrations. Who Killed Jihad Masharawi’s Son, Omar? JM: “Yes. My sister-in-law was killed along with my son and my brother and my other son were wounded [the brother has since died — ed.]. It is, as you can see, situated within a civilian area. As you can see by looking at aerial photographs of the Gaza Strip, the area contains a large amount of open and agricultural land. It would be entirely possible for Hamas and its allies to store their missiles in and fire them from somewhere other than residential and civilian areas: near mosques, hospitals, playgrounds, football fields, and private homes. However, they choose instead to situate them in locations where they know that, if they are hit by even the most precise of surgical airstrikes, the secondary explosions will quite possibly cause destruction and death in their area. I’ve posted below a short video which shows what happens when Israel hits an ammunition cache. These are precisely the consequences that Hamas intends. It is often said that this tactic amounts to sheltering behind skirts and prams as it seeks to kill Israeli civilians. I think that’s precisely what it is. Who killed Jihad Masharawi’s son? The idea that Israel, which managed to kill less than one civilian for every 30 airstrikes in Gaza, targeted the house of a low-level BBC employee during the initial wave of attacks – while he wasn’t home – is simply not believable. Unless you are convinced, ab initio, of Israel’s monstrous nature, there are other explanations that fit the incident far better. However, that still allows for the possibility that an Israeli missile went astray, or that the attack on the house was intentional, but resulted from mistaken information. That certainly could have happened. Nevertheless, there are two other possibilities which should be considered. The first is that Hamas or its allies launched a missile at Israel, but that it fell short and hit Jihad Masharawi’s house. That, quite possibly, is the cause of death of Mahmoud Sadallah, whose body was displayed to the world’s media, to be kissed by the Egyptian Prime Minister. Although it was widely claimed in the press that this child died in an Israeli strike, none appears to have taken place at the time of his death. By contrast, estimates of the percentage of the Hamas rockets which fall short and fall within Gaza range from between 15% and 40%. Damage to homes in Gaza by missiles is particularly perilous, because a large number of homes have propane gas heaters, and domestic generators. A missile or shrapnel hit can cause a secondary explosion. In any event, the Elder of Ziyon notes, the Daily Mirror has now removed the news item which most prominently covered the story, but has not announced its reason for doing so, or considered the matter further. The final possibility is that the shrapnel which hit Jihad Masharawi’s house resulted from an explosion or a secondary explosion on one of the weapons caches and launching sites near his home. Which theory is correct? We can’t know for sure: at least not yet. Perhaps there will be an investigation in which facts will become apparent. Israel knows where it launched attacks. It may have intelligence which shows the sites of misfired Hamas etc. rockets. Their proximity to Jihad Masharawi’s house could be ascertained. Who is morally responsible for the deaths of civilians, where despite not being targeted, they die when Hamas shoots wonky rockets which fall short, or when Israeli missiles ignite weapons caches that are intended to be fired at Israeli cities? I can guarantee you that there are many who take the view that even in these circumstances, Israel and Israel alone should be held accountable. Despite the evidence pointing towards an Israeli air-strike, some have suggested it might have been a misfired Hamas rocket. But at that time, so soon after the launch of Israel’s operation, Israel’s military says mortars had been launched from Gaza, but very few rockets. Mortar fire would not cause the fireball that appears to have engulfed Jihad’s house. Others say that the damage was not consistent with powerful Israeli attacks, but the BBC visited other bomb sites this week with very similar fire damage, where Israel acknowledged carrying out what it called “surgical strikes”. Like at Jihad’s house, there was very little structural damage, but the victims were brought out with massive and fatal burns. As BBC Watch points out, there is no basis for Donnison’s conviction that an Israeli airstrike hit Jihad Masharawi’s house. Donnison provides observations based upon what he believes to be similar patterns of fire damage. However, the pictures show merely a hole in a building and a fire, which may have been caused by an Israeli airstrike or by any of the other possibilities canvassed above, including one of the ‘very few’ rocket strikes which Donnison discounts. There’s no discussion, either, of the evidence of Jihad Masharawi that ’shrapnel’ – not a rocket – hit his house. That is at odds with Donnison’s belief that the attack looked like the aftermath of an Israel “surgical strike” with a missile. In any event, I don’t know whether an exploding Israeli missile would have left identifiable fragments, but certainly none have been produced. With limited data, Donnison can’t be sure: but it is very clear what he thinks. As well as expressing near-certainty that an Israeli strike killed Omar Masharawi, Our Own Correspondent also contained a graphic description of the state of his body and the natural and terrible agony of his father. I think that, having been told the horrific story of how Israel launched a missile into a BBC employee’s house, killing his son, and having heard about the impact of that missile on a tiny child’s face, most people would be unprepared to discuss the possibility that the death had resulted from some other chain of events. If Israel deliberately launched a missile into a civilian’s house, it should be condemned. If Israel did so, believing that the house was in fact occupied by a military target, then the BBC ought to investigate how it came to make such a terrible mistake. If Omar Masharawi died as a result of a misfired Palestinian rocket or mortar, then that should also be investigated and condemned. Were he to have died following an Israeli strike of a Fajr5 rocket site in Zeitoun, then that should at least be reported. 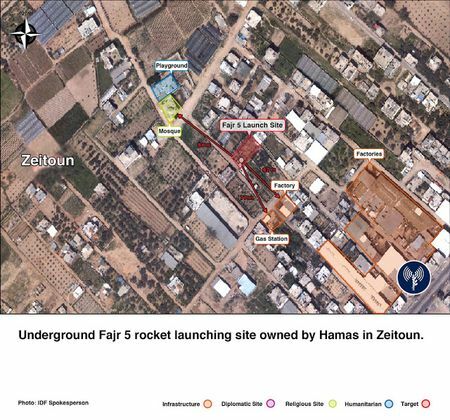 The BBC should ask Hamas why it put a Fajr5 launching site in the middle of a civilian area. It could ask Israel the same question: and its answer would be that it knew that these rockets were being prepared for launch at Tel Aviv and Jerusalem. I expect that some effort will now be put into trying to find out precisely what happened. If Israel’s culpability is ascertained, that too will be reported and Israel is likely to express regret, which will be regarded as insincere by most partisans of the Palestinian cause. If further evidence of Hamas culpability emerges then, from past experience, that is likely not to be reported at all. Hamas will express no sorrow, because it does not in fact regret the deaths of Palestinian civilians, and because it knows that it will never be pressed on its siting of missiles and caches within civilian neighbourhoods. In arguments on the internet, and at public meetings, we will be told that Israel should not have responded to missile attacks at all, which are in fact incapable of doing any harm, and in any case deserve them because of the supposed ‘occupied’ nature of Gaza. [F]or a wide swathe of left-liberal and ‘anti-imperialist’ opinion there is now no way Israel can conduct itself from which it will earn moral credit. It is irredeemably tainted in its origin. Conversely, and in the same quarter, there is nothing that Hamas or other representatives of the Palestinian people can do, no wrong or outrage they can commit, which will not be morally ‘cleaned up’ by the perception that these representatives are supposedly the pure vehicle of a struggle against injustice. One of the reasons for this opinion is that much of the media prominently report the deaths of children when they can be attributed to Israel but, as the Daily Mirror’s quiet de-publishing of its story illustrates, have very little to say when the facts shift and the story becomes less certain. It is embarrassing to read this statement, which includes the fact that 130 rockets slammed into Israeli towns on the last day until the ceasefire came into effect at 9 PM. It does not even mention that 20 more struck between 9 PM and midnight. While many Hamas rockets and launchers were destroyed, clearly many were not. Hamas has been building fortifications since 2009, and much of this infrastructure escaped the air bombardment. Hamas was certainly dealt a serious blow, but not a knockout punch. Its Iranian weapons suppliers will soon re-equip it, and it will probably get millions in ‘humanitarian’ aid from its friends in Europe. Israel’s operation is estimated to have cost 3 billion Israeli Shekels (about $770 million). Each Tamir interceptor fired by Iron Dome cost $40,000. Now there is a ceasefire, and 30,000 reservists (cost: $60 million) will likely be sent home. Hamas established that it can hit Tel Aviv and Jerusalem with missiles that can only improve in the future. It established that — by launching a large number of rockets at once, as it did in an attack on Beer Sheva today — it can overwhelm the Iron Dome system. It established that it can withstand a concentrated air attack and still fire rockets. But Israeli leaders look glum. 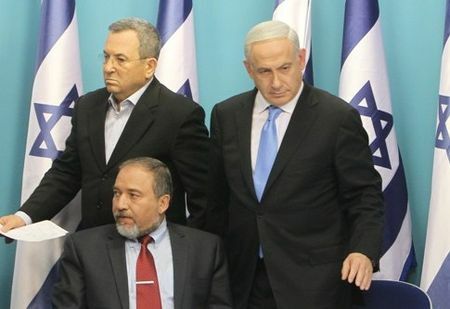 Defense Minister Barak, Foreign Minister Lieberman and PM Netanyahu announce the ceasefire. They aren’t smiling. As always, Israel’s overwhelming military might can’t stand up against the ‘persuasive’ powers of the White House, and yet again defeat is snatched from the jaws of victory. There will be another round, and another, and another. But what do you expect? Israel is addicted to US weapons systems and spare parts — and now, to the Iron Dome system, developed in Israel but funded by the US. Saying no is unthinkable. One question that Israelis are asking is this: why didn’t Barak and Netanyahu expect this? Did they have assurances from the Obama administration that they could go into Gaza, assurances which were later withdrawn? It doesn’t make sense to call up 30,000 reservists just to scare the other side. We’ll probably never know exactly what happened. But no matter how hard I try, I can’t interpret this as a positive outcome for Israel. The US position on the Gaza situation has been surprisingly refreshing. Both the State Department and the president have clearly said that Israel has a right to defend itself and that stopping the rocket bombardment of Israel is a prerequisite to a cease-fire. Perhaps I’m cynical, but what’s going on here? The last time Israel fought with Hamas, the incoming Obama Administration pressured Israel to get out of Gaza before the inauguration. After the Mavi Marmara affair, the US forced Israel to end its economic warfare against Hamas. Does the US, at long last, really want to see Israel defeat Hamas? I think that it does, but the reason is perhaps not the one we would wish for. This is a longish story, so bear with me. Here’s a clue: with typical Arab solipsism, the Syrian opposition SNC claims that Israel has deliberately provoked a war with Hamas in order to distract attention from the Syrian civil war, and to help Bashar al-Assad stay in power. Of course this is insane. It is doubtful that Israel wants to keep Assad, since it is by no means clear that the replacement regime would be worse for Israel. And even if it did, the ongoing war is all about Hamas rockets, not Syria. But let’s turn it around: Maybe Hamas chose this time to escalate its rocket attacks and provoke a reaction, in part because of events in Syria. 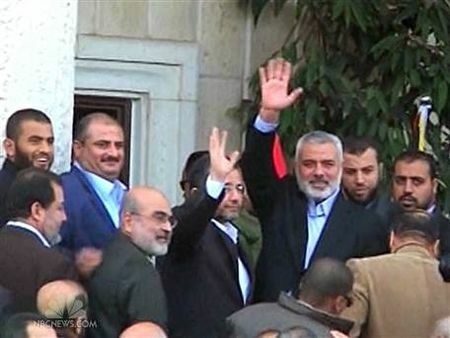 Although Hamas is the Palestinian Muslim Brotherhood and therefore aligns politically with the Brotherhood in Egypt, its main patron and weapons-supplier has been Iran. And Iran has a great deal of interest in helping its puppet Assad, whose regime anchors Iranian interests in the western part of the Mideast. And that’s not all (or even most) of it: Iran wants to keep the IDF busy with Hamas so that it will not go after its nuclear program. I suggest that the real provocateur of this war is Iran. Iran is pouring weapons into Gaza, some of which were recently interdicted — by Egypt! This isn’t surprising, considering that Egypt and the other Sunni regimes in the region are very worried about Iran, almost as much as Israel is. They want Assad out and Fordow cratered. In other words, the Palestinians are yet again a pawn in the greater struggle of the Mideast, the Sunni-Shiite conflict, with Iran and the Assad regime on one side and Saudi Arabia, Egypt and Turkey on the other. The US, then, in opposing Hamas, is actually supporting its Sunni allies in the region. It is just a happy coincidence that this enables them to support Israel as well. 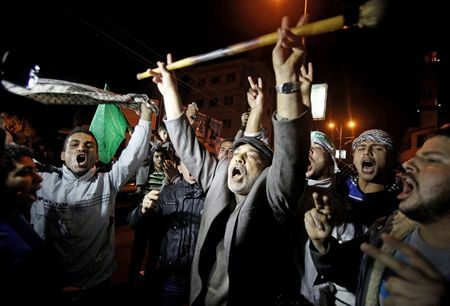 I’m hearing noises that the US would like to see the Hamas regime replaced by our pet Arabs, the Palestinian Authority. If this happens, the pressure on Israel to leave the territories, even to create a corridor between Judea/Samaria and Gaza across Israel, will come back on with a vengeance. As I write, there is yet another announcement that a ceasefire agreement has been reached. We’ll see.